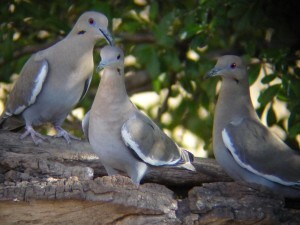 An easy way to explain the White Wing Dove’s soft call is to ask, “Who cooks for you?” These birds, with their folksy calls, are well known to many residents of the more arid regions in southern North America. Nesting singly or in flocks, White Wing Doves are usually found in tree groves or scrubland characterized by mesquite trees and cacti. They eat cactus fruit, nectar, seeds, and grain. In fact, White Wing Doves are quite important ecologically, dispersing pollen for many plant species. Flocks of White Wing Doves can get very large, and at a good feeding ground, thousands of these birds may congregate. Normally, they are active mostly in early morning and late afternoon. During these times, they will fly from their roosts or nests to feeding areas. White Wing Doves are migratory, and spend the cooler months in southern Mexico or Central America, where they form mated pairs. They usually arrive in the northern summer breeding grounds by May. White Wing Doves have fairly heavyset bodies, and, of course, white wings. The wing patches are best seen when the White Wing Dove opens its wings; otherwise, they are visible as outlines on folded wings. White Wing Doves’ tails are rather short, and have white, rounded corners bordered by a black line. There is a teardrop shaped orbital ring that is pale blue, and a long dark mark is often seen below the eye. The black bill is relatively long. 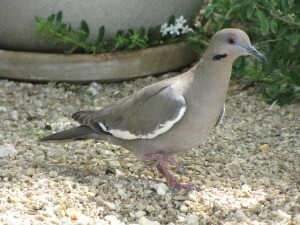 The White Wing Dove is predominantly grayish brown in color. The primary flight feathers and the tail are darker. Many White Wings Doves have a slightly iridescent purple coloring over their necks. By maturity, most measure between 10 and 12 inches (29 centimeters) long. 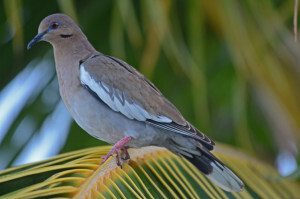 White Wing Doves are native to most areas of northern Mexico and the southern United States. Many migrate south as far as Central America in winter months. 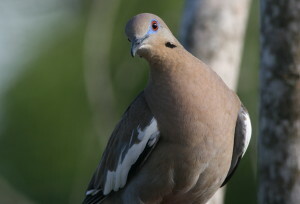 Although White Wing Doves were once numerous in the southern United States, their numbers were depleted through habitat loss and pollution. Today, their populations are relatively stable and they are popular game birds. Courtship displays are often beautiful, when male White Wing Doves will show off for their mates. They fly high into the air, swoop back down to the ground, flutter their wings, flash their tail feathers, and puff out the plumage over their chests. They usually nest ten to 25 feet above the earth in the crotches of trees, or on top of abandoned nests. The nests are built of twig platforms and improved with grasses and straw. White Wing Doves of both sexes participate in the raising of their young. An average clutch contains two eggs, which will require about 14 days of incubation. They are often whitish or light buff in color, and both parents sit on them. Once the eggs have hatched, White Wing Doves nourish their young on “pigeon’s milk”, a white liquid substance formed in the crop lining. By the time they are four days old, the hatchlings can eat seeds. White Wing Doves usually leave the nest at two weeks of age. In more northern areas, one brood is average, although further south, some White Wing Doves may raise three broods each year.